My second attempt on making a plush doll, turned out a little bit better. I learned to use a sewing machine, yay!, so the process was much faster. I will start a second plush, and this time I'll try designing a boy. Hi! 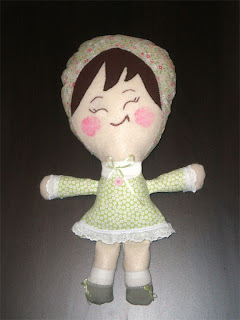 Cool Blog, LOVE THE DOLL. I’ll add your link on my blog, please link me too using: Valerio Ventura. Your designs are really cool. Hi Sadie. Love the doll. You should make more and then I can get one for Chloe.